Cafe & Bar Open 7.00pm Full Bar. 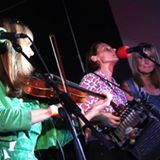 They are fun, energetic, exciting and play great Cajun music. That is why they our favourites at the festivals and favourites with us. This all female band was really great to start with and I don't know how they do it, but they seem to be even better each time they play for us.